"Science and everyday life cannot and should not be separated"
Rosalind Franklin, chemist, her X-ray diffraction studies on DNA were crucial in revealing the double helix structure. She never received a Nobel prize as Watson and Crick did in 1962. She died of ovarian cancer when she was 37. Foss 4000 For Sale. Working Order, just replacing with a newer instrument. Farms, factories, food processors, orchards, vegetable growers, homeowners and Realtors. 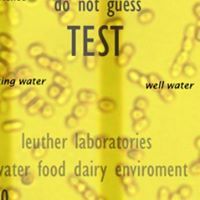 Coliform and E. coli in drinking water and other water bacteriology. as quickly as testing methods allow. receive a call about these programs.